If problems occur that trigger alarms, it is important to be able to react quickly and appropriately. The Industrial Performance Analyzer integrated in zenon creates a quick overview of your alarm messages. This helps you to prioritize your activities and quickly resolve problems. 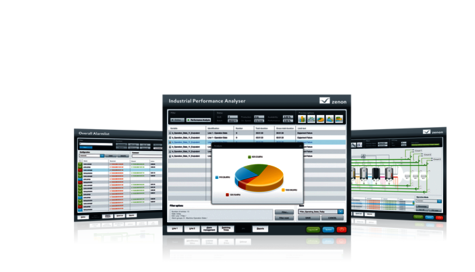 The Industrial Performance Analyzer helps to evaluate alarm data statistically and visually; providing you with a clear overview. Problem areas or bottlenecks can be localized and documented with this extremely easy-to-use tool. It helps you identify quickly which problems occur most frequently and which cause the most downtime. Targeted measures can be implemented immediately. Their success can be verified straight away with the help of statistical evaluation. This means the downtime of equipment can be minimized and productivity and effectiveness can be increased considerably. zenon Runtime writes the alarm and shift information (when the Production & Facility Scheduler is used) in an ODBC-compatible SQL database (not supplied.) Several Runtime systems can store their data in a central database. The data can therefore be evaluated using several items of equipment or multiple systems.